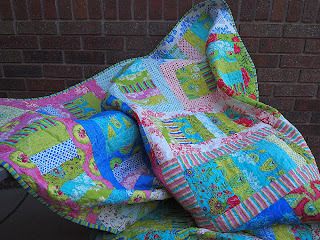 I quilted two quilts on my Mega Quilter this week. The dark color is purple, it doesn't show up very well in my photo. I used an overall meander stitch with a new polyester-wrapped poly thread, "Omni" that I bought from Superior Threads at the Cincinnati Quilt Festival. This thread has a really nice sheen, it looks a lot like rayon thread, but it's much stronger. The second quilt I long-armed is "Strips and Ladders." The fabric is Lily Ashbury's "Summerhouse." and the backing is some pepto-pink from the stash. I pieced this quilt at Granny's Attic's "Quilting in the Pines" retreat in Idaho last October. 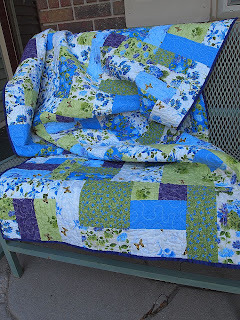 I quilted it with the same thread, but used a loop design that is really fun to quilt. I just put on some swing music and loop-de-loop! I'm going back to "Quilting in the Pines" next week, and taking this quilt along to put on my bed. It's been snowing this week in McCall, so I might decide to take two quilts! What a busy bee you have been! What lovely quilts! I love the Summerhouse fabric. Saturday Stash -- I Won!